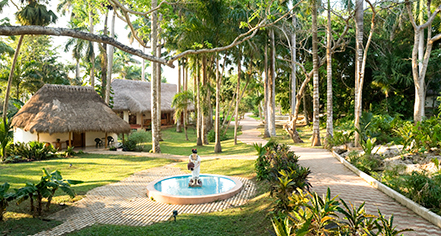 At Mayaland Hotel & Bungalows, guests are invited into an exclusive world entrenched in ancient Mayan history. 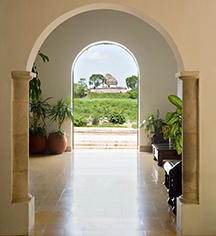 With five spacious types of guest rooms, suites, and bungalows, every adventure in the Yucatan is promised to travelers, with views of Chichen Itza and the surrounding landscape from their accommodations, beckoning them to explore. The cultural experience of Mayan history is introduced at every turn, from authentic dining experiences at any of the property's four restaurants and poolside grill, to onsite activities and cooking lessons encouraging the knowledge of longstanding traditions. The surrounding region can be explored at leisure, with relaxing activities such as charming beach towns, to more adventurous expriences, from scuba diving in cenotes, to moonlit horseback riding and swimming with dolphins. With the historic ruins of Chichen Itza located just steps from property grounds, travelers are able to meander and explore with no limits. Mayaland Hotel & Bungalows, a member of Historic Hotels Worldwide since 2015, dates back to 1923. Mayaland was the first modern hotel built at Chicen Itza, the ceremonial center of the ancient Mayan Empire. Cancellation Policy: If the reservation is cancelled 15 days or more before check-in date is fully refundable, minus a $15.00 processing fee. If the reservation is cancelled 14 to 8 days before check-in date, there is a 15% penalty charge. If the reservation is cancelled 7 days or less before check-in date the reservation will be subject to on a one night charge. No shows are nonrefundable. All cancellations must be made in writing and e-mailed to our office in order for any applicable refunds to be issued. Please Note: For all cancellations the Confirmation Number must be provided. Deposit: Complete payment Hotel rate plus tax must be received before reservation can be confirmed. Hotel space and rates are not guaranteed without a deposit. Hotel/Resort Fees & Taxes: The rates are in USD, for single or double basis in European plan (no meals) and are subject to 16% federal tax and 3% hotel tax. There is no extra charge for children under 12 years when sharing room with adults. Rollaways: Available upon request; MXN 540.00 per night. Shuttle Service: Shuttle service to and from the airport may be scheduled through the resort's concierge. MXN 4900 per vehicle (one way). Learn more about the History of Mayaland Hotel & Bungalows .